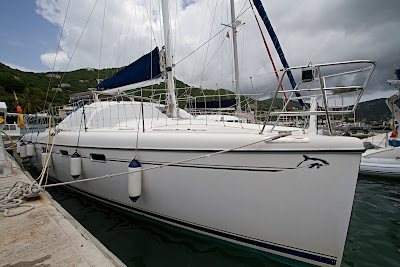 Bareboat sailing with 6 kids is an experience unlike any other trip I've taken in the BVI. The kids, age 6-18, uncovered a world of wonder and opened my eyes to another dimension of exploration here. 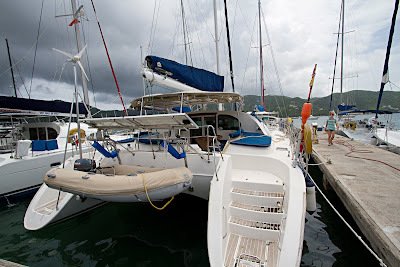 We chartered with Conch Charters, and sailed a Privilege 435 Catamaran, Jeannius, for a week and a half. It was an absolutely fantastic experience. Sailing with kids - a family of 8 - required a lot of preparation and careful planning. The first change we made was to send down an advance crew. I flew down with Zack, my 16 year old son a day ahead. Zack and I planned to load provisions and go through checkout with the boat a day early, then sail up to pick up the family the following night right next to the landing strip on Beef Island. We also took most of the luggage, consisting of very large duffle bags, so the rest of the family would have an easier time with the younger kids. We arrived late in the evening, and all of our bags made it. When traveling with adults, I usually only take one duffle as a carryon, thus eliminating the risk of losing a bag. But with so many people traveling, we decided that a few checked duffles were manageable, particularly because a late bag could be picked up the following day at the airport if needed. The duffles let us carry some provisions to save money on groceries, and bring masks, snorkels, and life jackets for the kids since they wouldn't be at the charter office to try them on for size. 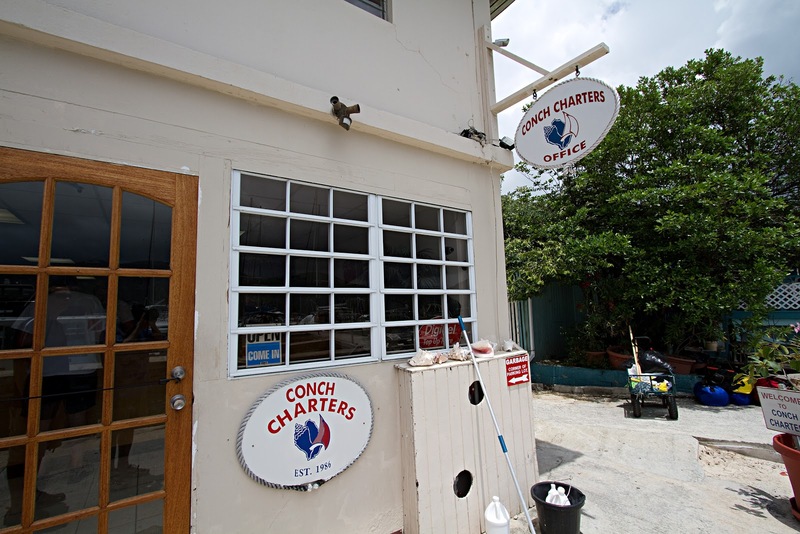 Conch Charters' staff was very friendly and helpful, as usual. Their taxi driver met us at the airport and we rode the crazy, winding road back to Road Town Harbor in the dark of the night. Conch's staff had left the boat all set up for us, with the air conditioners ready and lights on so all we had to do was walk down the docks and step aboard. 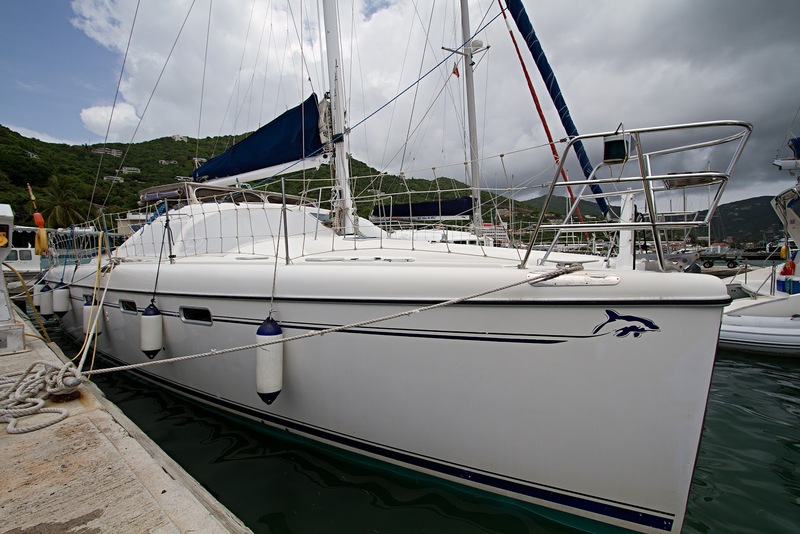 The Privilege 435 is a tremendous catamaran. At 44' long she sports large berths, each with a separate head, a spacious galley, and an enormous cockpit. 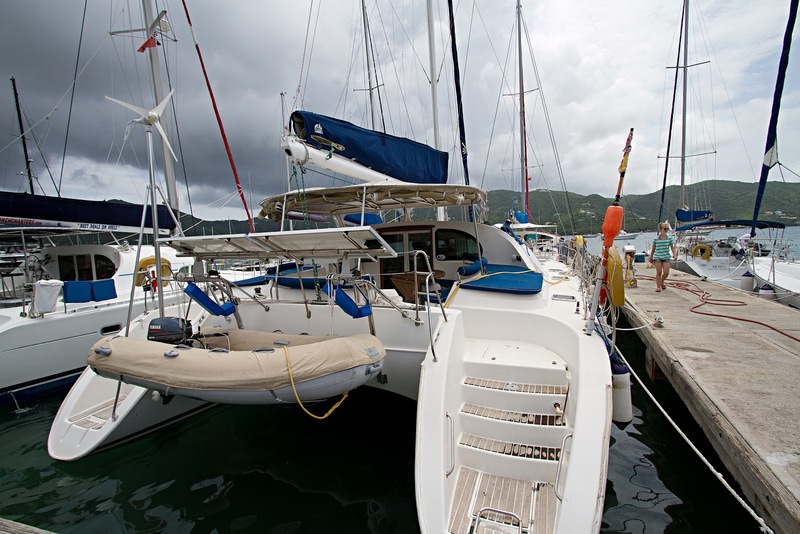 This catamaran, Jeannius, had just entered the charter service following a cirvumnavigation. Her owners, Mike & Jean Beswick, keep a blog of Jeannius' ongoing travels around the world which you can read here. The boat is extremely well equipped and well taken care of. She sports a solar array and wind turbine that kept the ample house batteries topped off and had a fridge and freezer that really refrigerated and froze! To get to day 2 of this trip, scroll down and click the "Newer" or "Next" post button. Nice post, thanks for sharing your personal experience. Caribbean is really the best place for spending our memorable weekends. And BVI is listed in one of the top most island of the Caribbean. And there is no other better way to explore its beauty by chartering a yacht or boat in your Virgin islands sailing holidays. I love to visit there every year.